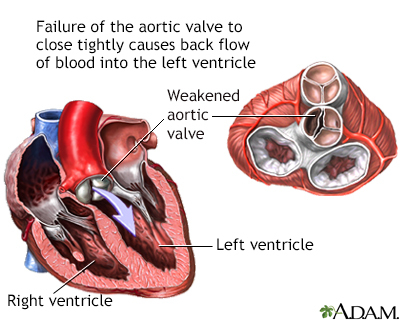 Aortic insufficiency is a heart valve disease where the aortic valve no longer functions adequately to control the flow of blood from the left ventricle into the aorta. Commonly, aortic insufficiency shows no symptoms for many years. Symptoms may then occur gradually or suddenly. Surgical repair or replacement of the aortic valve corrects aortic insufficiency.